Welcome to Enthusiastic About Life! I’ve thought long and hard about whether I should make the plunge to change my website/blog name and I’ve decided it’s time. If ABC Family can change their name to Freeform, then I can too! The reasoning behind the name change is that I recently attended the We All Grow Conference with a ton of very talented bloggers and every time I met someone and they asked me what the name of my blog was…I had a hard time explaining the original name (mairaLBL) and what my blog was all about. The name of my blog wasn’t intuitive or user friendly, and as an engineer that is a big ‘no no’ for me. So I thought and I thought, and I brainstormed and I brainstormed and came up with a few new names. I want to keep the bucket list mentality/journey going and came up with a few names but I wasn’t in love. I then realized, sometimes it’s hard to talk about yourself, and it’s way easier to talk about others, right? 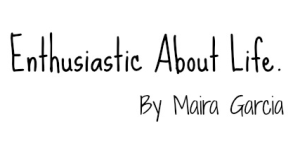 So I thought about how people have described me and my blog and I came up with the perfect name. And the great thing about having a blog is that I can prove that I’m not making this up haha. A few months ago, a friend of mine invited me to cross off a bucket list item with her (and it was a super random one). I said yes of course, and I told her ‘thanks so much for inviting, but this is super random, why did you invite me?’ And her answer has resonated with me since that day. She told me ‘because you’re always so enthusiastic about life‘. She very succinctly summed up what I am all about. Thanks Melanie, you’re awesome!! And if you don’t believe me, check out the blog where I talk about Melanie. So that’s it. That’s the very simple reasoning. Plus, nobody can ever spell my name right haha. < Previous 8 Reasons To Get The Scion iA! Next > My first #WeAllGrow Blogger Conference! I simply want to mention I am newbie to blogging and definitely liked this blog site. Most likely I’m going to bookmark your website . You actually have fantastic stories. Appreciate it for sharing your website page.